So, is it possible to raise a healthy family while sticking to a strict budget? The answer is Yes! But how? The first step is to set a budget. Using our new “Budget Friendly Shopping” (link) handout, you can use US National Averages and our budget calculating tool to identify the budget that best fits your family. This tool provides calculations for families of all sizes with children at any age. Using this tool, you can create a budget that is the best fit for your family. After you know your budget, the next step is to plan your meals. Whether you plan by the week or month, creating a meal plan and sticking to it will help you stay on budget. As you create your meal plan, there are two things that we think are most important to remember. First, remember to include foods from each food group in every meal. The second is to remember appropriate serving sizes. Many times, extreme food costs are a result of preparing and consuming too much food. Now that you have your meal plan complete, it’s time to make a grocery list and head to the grocery store. Remember to buy off brand whenever you can and try to purchase foods that are on sale while you are at the store. If you’re familiar with grocery prices, try to estimate your grocery bill before you get to the checkout to make sure you’re staying on track. If you’ve not paid close attention to prices in the past, spend a few weeks learning about your new meal plan and budget to learn what foods you can include and which ‘pricier’ foods you may want to hold back on. So, we’ve shared how to calculate your budget and how to create a meal plan. 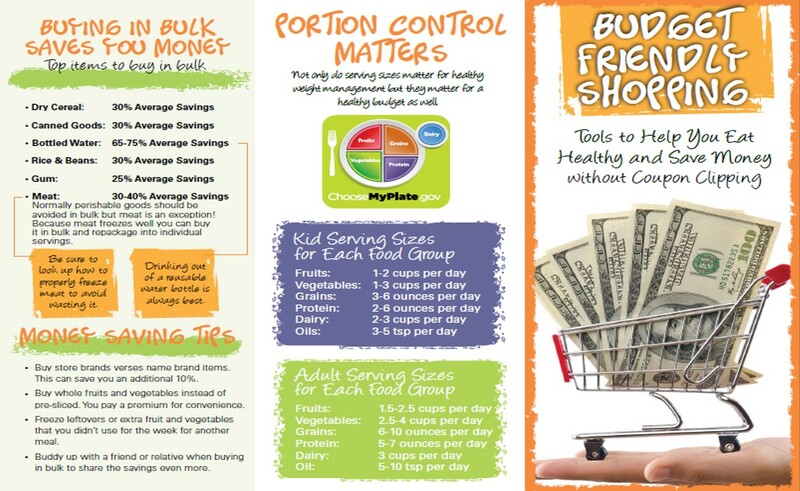 Do you still need more motivation to check out our new Budget Friendly Shopping handout? This should throw you over the top! We’ve also included a 1 week meal plan for a family of 4 for less than $170. How do you feed your family on a budget? We love hearing from you, our readers. So, please share with everyone the tips that you find most effective for feeding your family healthy foods on a budget! You can share your thoughts here on the blog, on Facebook or on Twitter! May I know where is the link for Budget Friendly Shopping? ?